I just opened my 401(k) at the beginning of 2017. In 2017 it did great because of the bull market, but since 2018 I've lost about $1,000. All of my contributions this year have been a complete waste. I feel like a lot of that could have been avoided if I had put some kind of "hold" on the 401(k) during the weeks where the stock market performed really badly. Sure it wouldn't have grown either, but at least I wouldn't have lost so much. Is there any way I can protect my 401(k) during times like this or is this something I'll just have to get used to and trust that over time it'll correct itself? This is a problem that always looks worse than it is. Here's why. When you're young, and your 401k is weighted towards long-term growth, you're going to have large swings. That's expected, and you should never worry about it. Why? Because you're not selling now, you're selling years in the future. You don't realistically care what the stocks at any given moment, because it's kinda irrelevant when it comes to your actual retirement. What does matter is that the long-term growth is there, that you can expect decent percentage growth on average over a long period of time. And when you're older, nearing retirement? Your 401k should be weighted towards lower-risk, more stable investments (such as Bonds.) At that point, market swings really don't matter all that much to you either, because your retirement fund is no longer heavily influenced by them. A high of 2722 and subsequent drop to 1739. Just over 36% in a few months. My 401(k) was just over $20K at that time, and I 'lost' $7000 between those 2 dates. I recall thinking to myself, that if I were older, and passed the $1M mark, the drop would have been $360K, fully invested. Fast forward to the crash of 2008-2009. On the way down from 1500 on the S&P, a friend tells me he went to cash at 1000. At 666, the bottom, he felt pretty smug. But just over a year later, as the market recovered past 1200, he was still out. And earning close to nothing in CDs. To time the market, you need to be right twice, the friend got out, not great timing, but never got back in. I didn't sell at 1500, nor did I buy in at 666, save for the regular deposits, so for nearly a year, all buys were below 1000. For most of my life I was fully in, 100% invested, no 80/20, 75/25 mix. After we retired in 2012, and the market rose 32% in 2013, I took that as a sign, and shifted to the mix that sane people should have, about 25% cash, or enough to ride out a reasonable crash. As time goes on, the +/- $1K swings won't bother you. A $10K swing in a day won't even make you blink. What you are talking about is an idea called "Timing the market". A lot of other people with more time, focus, and education than you or I have attempted to time the market in the past and failed. You are more likely to get in too late, or get too edgy and jump out early, than to consistently navigate the market ahead of millions of other people (all of whom are attempting to do the same thing, and beat you in the process). Yes, it can be disconcerting to watch the market fluctuate, but you have years ahead of you working in your favor. Depending on your age there have likely been three or more significant recessions within your lifetime, so getting used to riding out the rough times and seeing the long term picture will both benefit you in the long run. One concept you might want to read up on is "Dollar cost averaging", which boils down to the idea that during recessions you can buy many more shares for the same (discounted) price, and make long-term gains while other people are making short-term losses. If you have a long time before retirement you don't try and protect losses. You cannot time the market. And in the long run the stock market always goes up. So when it is down you are getting a better value. During your lifetime you will see numerous large drops in the market. What's important when that happens is that you don't panic sell. It is almost a guarantee that you will end up selling at the bottom. I know plenty of people that did that in 2009 and lost half their retirement money. Those that didn't sell made all their money back and more. The only thing you could try is to keep some money in cash or a very short term bond fund if available in your 401k. And during the next big downturn put that cash to work. The problem with that is it takes courage to buy when the market is down big. If the stock market crashes beyond repair the money you lost will be the least of your worries. Think of it this way. The stocks you're investing in have just gone on sale. When things go on sale, people usually buy more of them rather than selling. If you don't intend on selling them soon (next 5 to 10 years), then this is great! My retirement date is further than 10 years out, so if the stock market crashed tomorrow (and the companies I was invested in remained healthy), then I would be super happy because I have a chance to buy the stocks cheaply. It's highly likely that they will greatly increase in value before I retire. If you're investing in mutual funds that cover a large part of the market, and your retirement date is far away, short-term market drops are a good thing. My IRA lost over 50% of its value in 2008 and stocks became cheap indeed. The value of my IRA is now far, far higher than it was before the stock market dropped in value. If I had sold then (which a lot of people did), I would have missed out on the subsequent gains. So think long-term, not short-term. The stock market has its ups and downs. I personally only check the balance of my 401k about once a year, make sure my investments are balanced, and ignore it the rest of the time. There's no point in checking it more often when my retirement date is so far away. If you are 5 - 10 years from retirement, I would suggest protecting money you'll need in the first few years of retirement by putting it in bonds. That will protect it from short-term market drops, but you won't get much return from it either. Keep the rest of the money in stocks because that money won't be needed short-term. Since I suspect you are far from retirement, my advice is to make sure you're money is in low-cost funds, contribute as much as you can, and don't worry about the month to month balance. Red - Your most valuable $100. 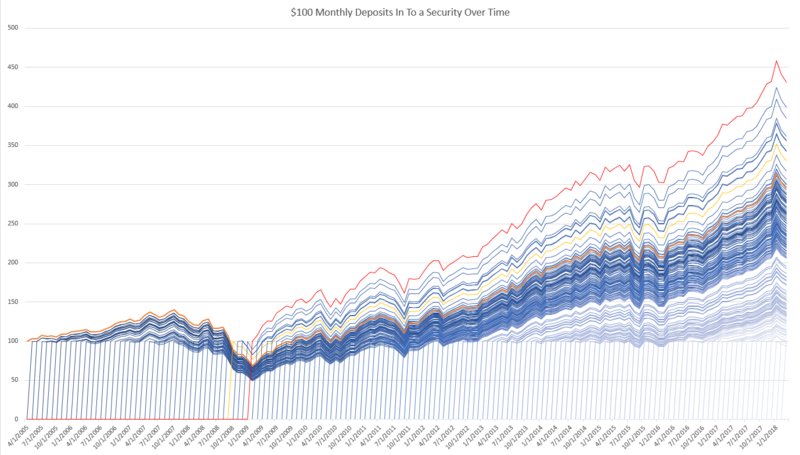 It doesn't really matter what the security is, the point is that the most valuable $100 is the $100 you put in at the bottom by complete coincidence because you simply bought $100 every first of the month. The $100 that you put in but was gobbled up by the losses you incurred for the three months following the purchase is worth nearly 2.5x more nearly 10 years later. Your very first deposit is worth 2x more. If you think of your account as a big stack of various $100 deposits it's a lot easier to simply ignore the fluctuations. Some of those $100s are $80 and some of them are $150. Over time the market has expanded, you buy your big basket of diversified companies and have faith that the market will expand in the next 30 years. I used adjusted close of VOO. I was too deep in to the formatting when it dawned on me that adjusted close for the whole dataset would improperly adjust the future purchases, each purchase should have its own dividend adjustment path but the point remains. The math is $100 times monthly percent change between adjusted close values so the actual charted difference would be minimal. As others have noted, timing the market is very hard. Sure, if you could buy when the market is at its lowest, and sell when it's at its peak, then buy it all back when it's down again, etc, you could make a fortune. The problem is, how do you know when the market is at its high and low points? There was another question on here where someone asked about comparing the performance of his investments with the best he could possibly have done. I did a little research and I forget the exact numbers for the time period he gave, but yesterday (as I write this) USG went up 19% in ONE DAY. If every day you could pick the one stock that would go up the most that day, you could have gains of 10 to 20% every day. Great in theory, the catch is knowing what that stock will be. Lots of smart people devote their lives to timing the market, and most of them are not particularly successful at it. If you're trying to just do it as a sideline to your regular job, well, I wouldn't say it's hopeless, but the odds are against you. Most of the time, you're just better to keep putting money in. In the long run, the market has always gone up eventually. What Warren is trying to tell you is that you've had nearly the best luck possible in your 401(k), which you mistakenly view as a "complete waste". The whole idea of saving in your 401k is to grow it as much as possible before your retirement nears. You are mistakenly wanting on your share prices to increase in the short run, when the opposite is to your benefit. If you invest money on a regular basis to purchase shares, bear markets allow the same invested amount to buy more shares, bull markets mean you'll purchase fewer shares. By the time you retire, purchasing shares cheaply can substantially increase your total account value. So stop obsessing over your 401k performance, it's a long game and investing steadily is the way to win it. And don't despair when stock prices fall substantially, instead rejoice thinking about how much it will ultimately benefit your retirement. Depending on your 401k provider, there are choices of funds of cash or cash-equivalents. They have a very poor return, but usually they don't fluctuate up and down. It's like you would keep your 401k contribution in cash. As previous answers said, it is very hard to predict when the market would go down. If you don't predict, you will lose the opportunity of your money to grow. Also, if you buy on a bullish market, it may be that you just bought at the highest price, and the market will go down. On my knowledge, it is impossible to short sell stocks with the 401k money. As short sale would use your money to gamble against the economy, I see plenty of reasons why the government will not provide tax incentives for such a behavior. If you want to put money on hold, you can usually invest it in a 'cash' or money market fund. The price per share is usually a dollar and it is somewhere you can put the money while you are waiting for a dip. The downside is, although the money is safe (they rarely "break the buck"), you are unlikely make enough from the fund to beat inflation (typically 2%), so in practice you're losing 2% per year for every year you have your money in 'cash'. If an opportunity comes up (e.g. the market goes down by 10%) then it allows you to switch out from that fund into a market based one (e.g. an S&P 500 tracker) and 'buy the dip'. I tend to wait for small corrections and transfer part of my 'cash' fund into the market, and then when the market reaches all time highs, transfer from the market back out. You can also have your contributions from your pay check go into the 'cash' fund, and then apply them when the timing is better. While I agree that it is impossible to time the market perfectly, a strategy where you put money in and take money out when the market corrects or rallies, can offer a slight improvement. One thing to be aware of is some funds will charge redemption fees if the amount of the fund you are converting is too high (e.g. more than 20%). You should check the fund's prospectus to make sure you are not going to get hurt with additional fees. My 401k provider puts a dollar symbol icon next to the funds that have higher redemption fees. Not the answer you're looking for? Browse other questions tagged united-states investing 401k risk-management or ask your own question. If the housing market is recovering, why would a REIT index ETF (e.g. VNQ) not be performing well? Should I move out of my actively managed IRA at Fidelity and put it all in index funds? How long can I convert 401(k) to Roth 401(k)? What are some signs that the stock market might crash?